If you wanted the Vee-Jay book but could not afford it, now you can! If you already own the Vee-Jay book, now you can take it with you everywhere you go! Optimized for the Apple iPad®. Works on any computer or device that reads PDFs. 8.5×11 Signature Card signed by Bruce Spizer showing the front and back covers of the book. You may also request personalization of the card (enter in field below). 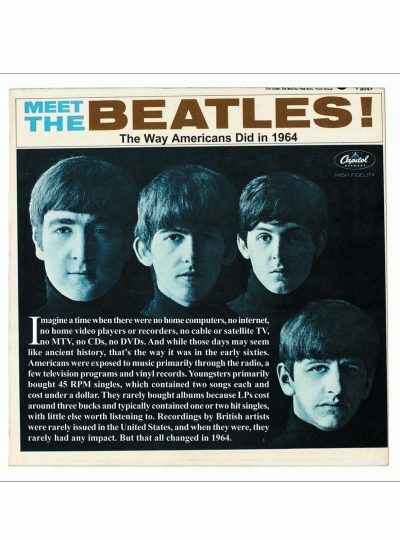 Ever since The Beatles Records on Vee-Jay sold out and began going for a few hundred dollars or more in the secondary market, people began asking me when I was either reprinting or publishing a revised edition of the book. And while I knew there was demand for the Vee-Jay book, I was concerned over the economics of reprinting. The Vee-Jay book was published over 15 years ago in New Orleans. Reprinting the book would not be a simple case of calling the printer and having him use the existing digital files to roll the presses. The original printing plates used for the Vee-Jay book were destroyed in the flooding that followed Hurricane Katrina, and even had they survived, technology has changed so much over the past 15 years that they would have been useless. Thus, I would have been required to go through the entire prepress process, effectively driving up the cost of a reprint to the full cost of a new book. With high production costs due to the use of color throughout the book, the cost per book on a small run would have been high, forcing a retail price of about $100 to make the reprint profitable. And while the cost per book would have gone down with a larger press run, I did not make sense to pay more overall printing costs and run the risk of being stuck with a large inventory of books that could take ten or more years to sell. Fortunately, some of the younger customers of my books began asking me if I had considered doing the Vee-Jay book as a digital eBook. At first, I was troubled by the idea. There is something wonderful about holding a beautiful book in your hands. Surely I would miss the feel of the pages and the experience of turning the pages. And as a collector, I love having my bookshelves filled with books. An eBook would not be on my shelf or proudly displayed on my coffee table. It would be stored in an iPad just like music was stored in my iPhone. 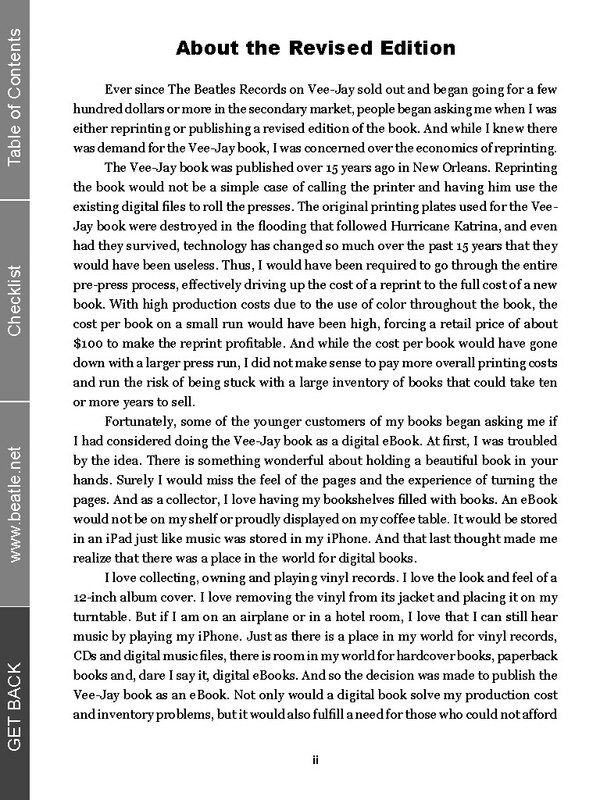 And that last thought made me realize that there was a place in the world for digital books. Once the decision was made to do an eBook, I realized that I could not merely put out the 1998 book as it was originally published. Oh sure, the book got great reviews when it first came out and demand for the Vee-Jay book had not diminished. But I learned a lot of cool stuff in the past 15 years and realized I needed to do a revised edition so that I could incorporate new information and images. This would also give me the opportunity to do some things differently and correct a few errors along the way. 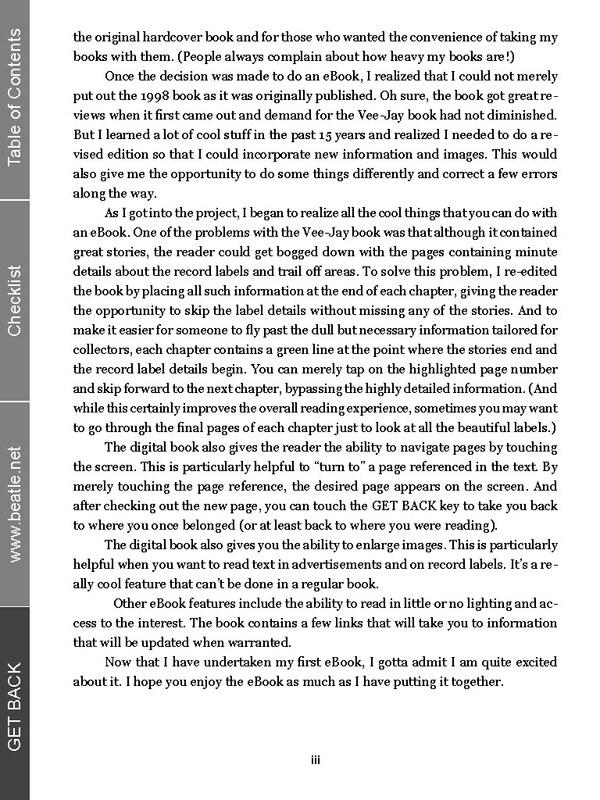 The digital book also gives the reader the ability to navigate pages by touching the screen. This is particularly helpful to “turn to” a page referenced in the text. 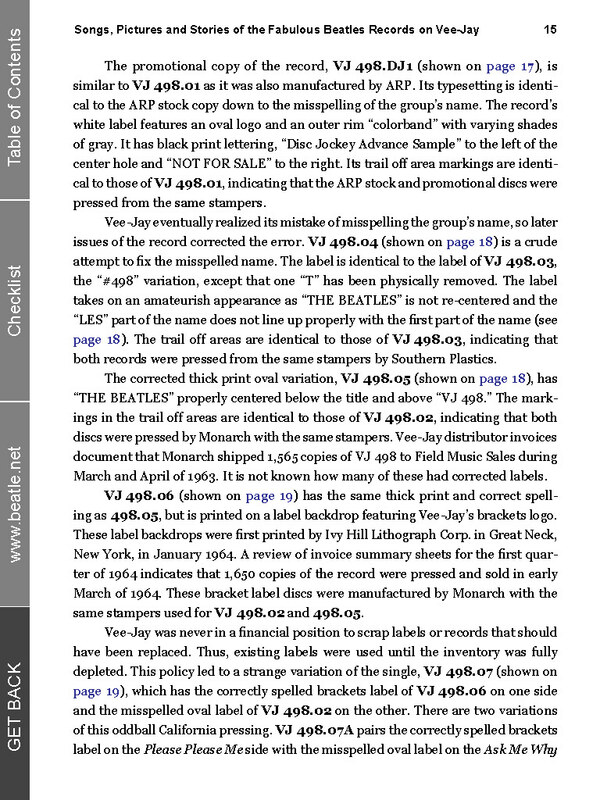 By merely touching the page reference, the desired page appears on the screen. And after checking out the new page, you can touch the GET BACK key to take you back to where you once belonged (or at least back to where you were reading). 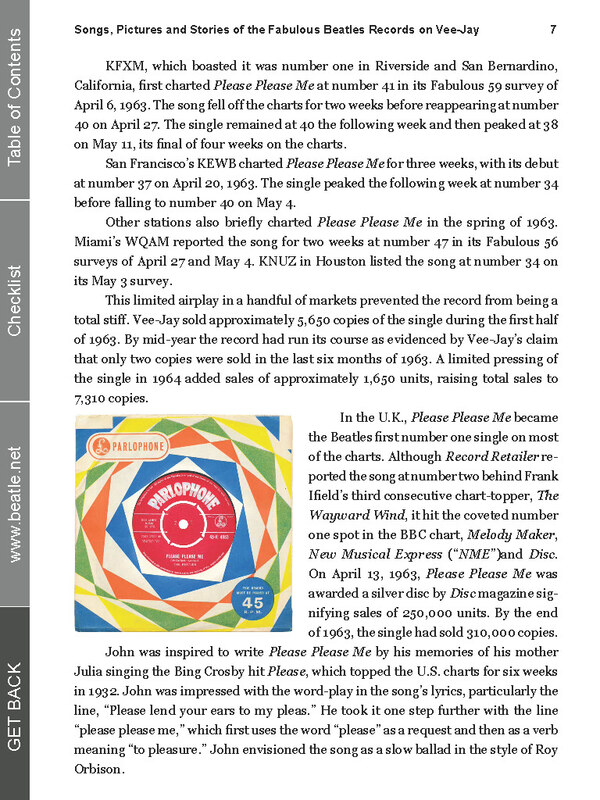 The digital book also gives you the ability to enlarge images. 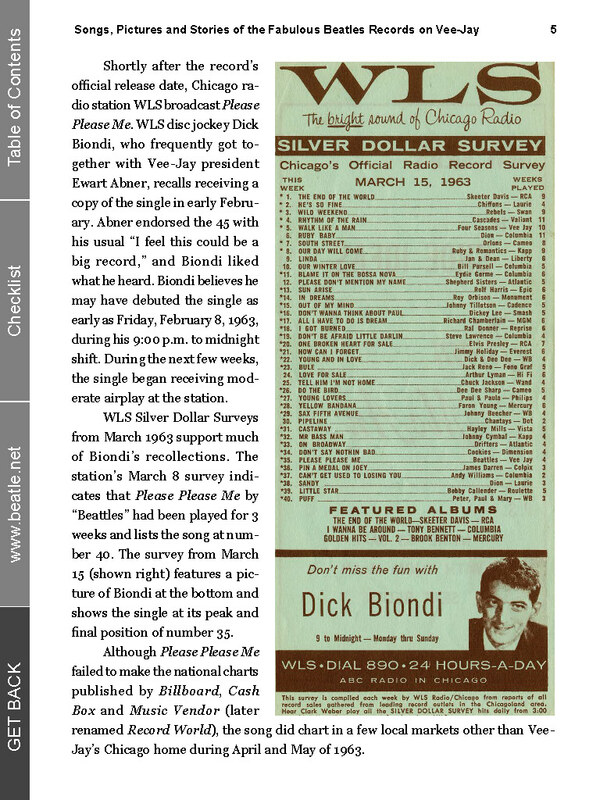 This is particularly helpful when you want to read text in advertisements and on record labels. It’s a really cool feature that can’t be done in a regular book. 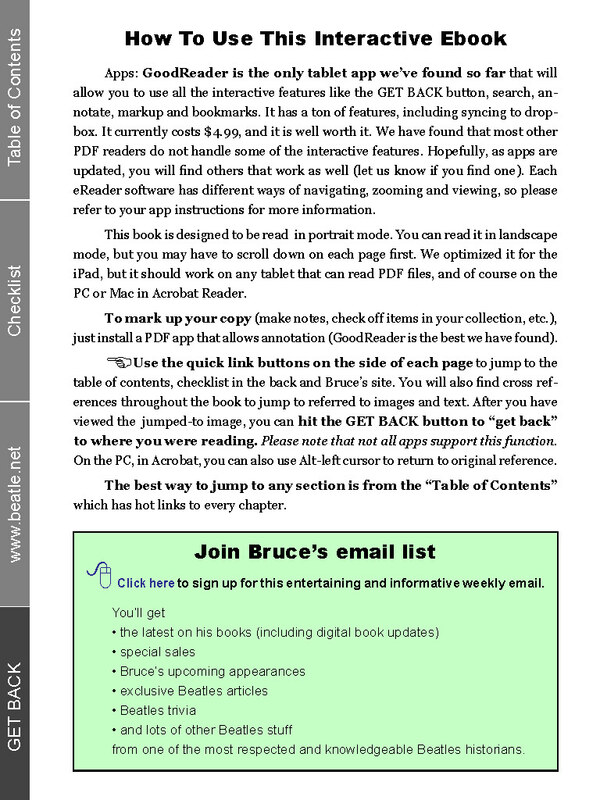 Other eBook features include the ability to read in little or no lighting and access to the interest. 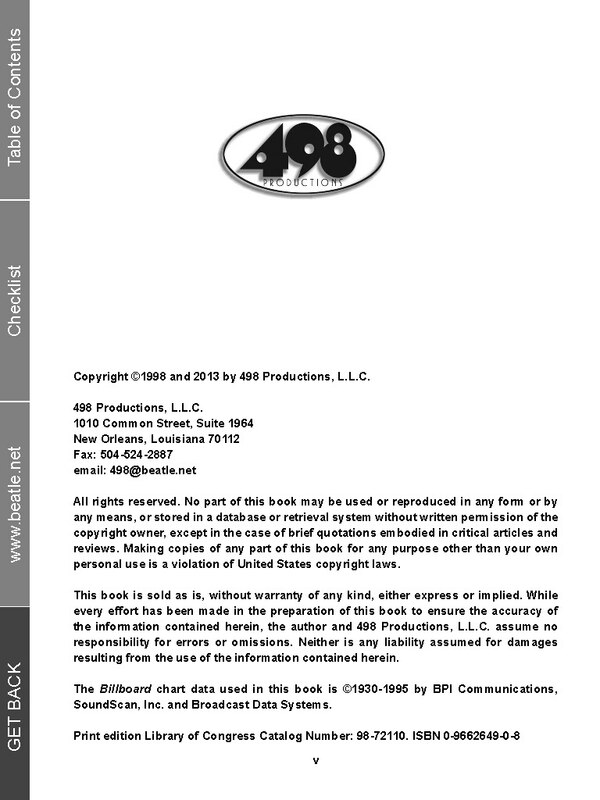 The book contains a few links that will take you to information that will be updated when warranted. Now that I have undertaken my first eBook, I gotta admit I am quite excited about it. I hope you enjoy the eBook as much as I have putting it together. Get this book! That’s my review. Get this book! 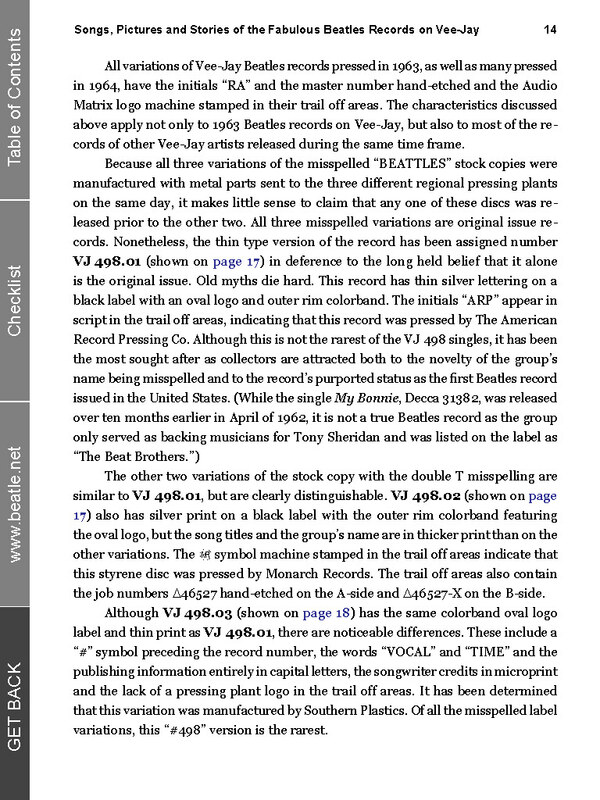 Mr. Spizer, who is a contributor to Beatlefan and Beatlology magazines, has rewritten the standards for reference books! 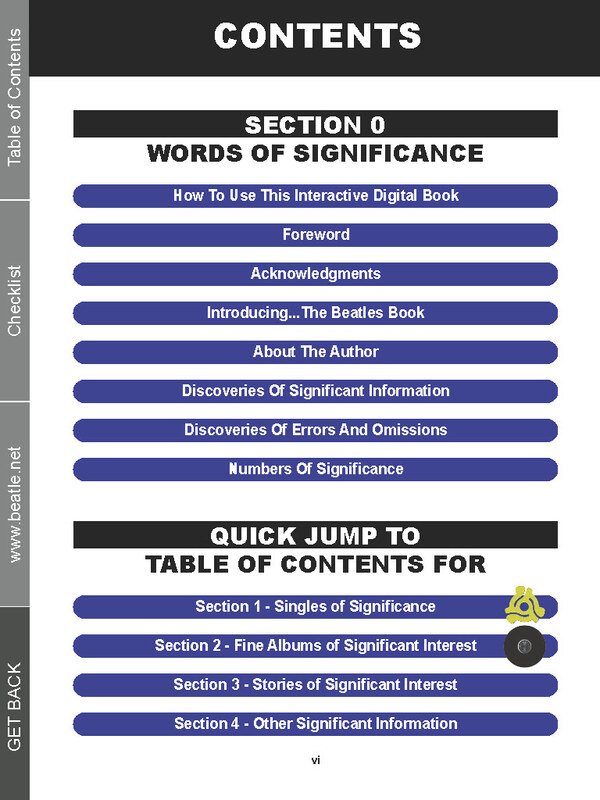 Detailed facts are presented with clarity in a logical, impressive, oversized volume. It is impressive because Mr. Spizer has documents and over 600 colour illustrations to back his facts. His book is impressive because of his thorough presentation. In a recent correspondence to Mr. Spizer, a Louisiana lawyer, I commented that because of his ability to dig and retrieve the truth, I hoped that I would always be on his side of the courtroom. 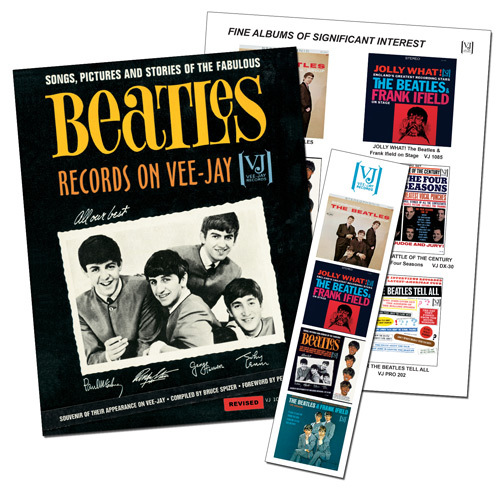 The book chronicles the Vee-Jay Records story, as it pertains to The Beatles, including advertising campaigns and marketing strategies. 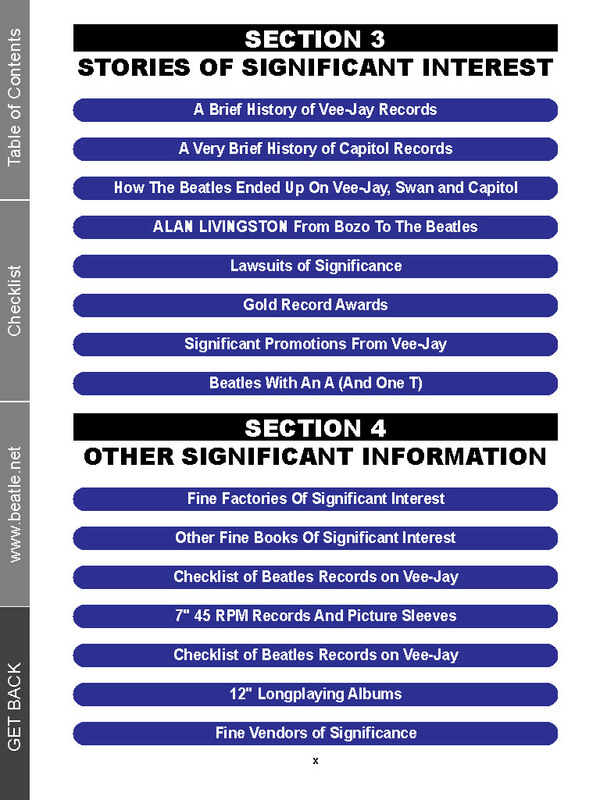 Mr. Spizer has compiled a complete description of how Vee-Jay lost the Beatles to Capitol Records and their fruitless legal attempts to retain their 16-song Beatles rights. I have only one small criticism. 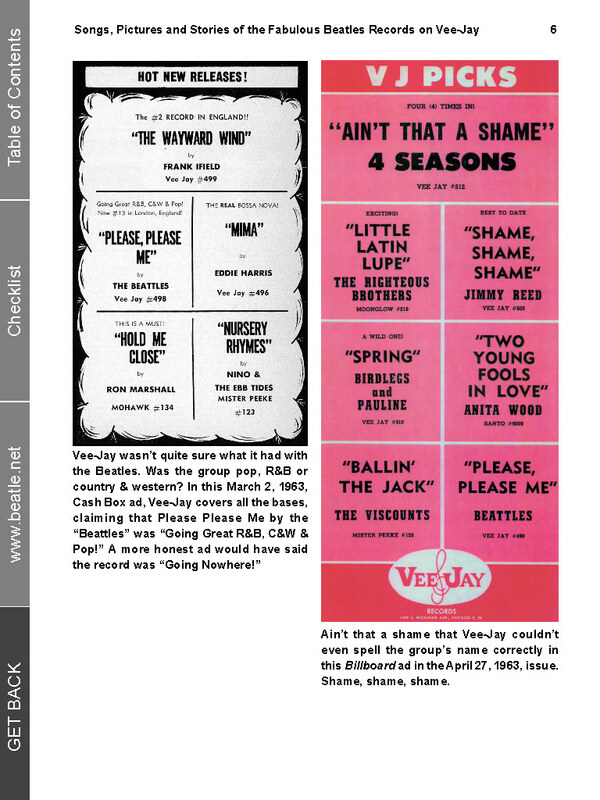 Vee-Jay once used an innovative ad-campaign to promote their Records of Significance. Mr. Spizer chose to use the Significance theme in all of his chapter headings. I found this unnecessary. The book costs $50 U.S., but it is absolutely worth every nickel. 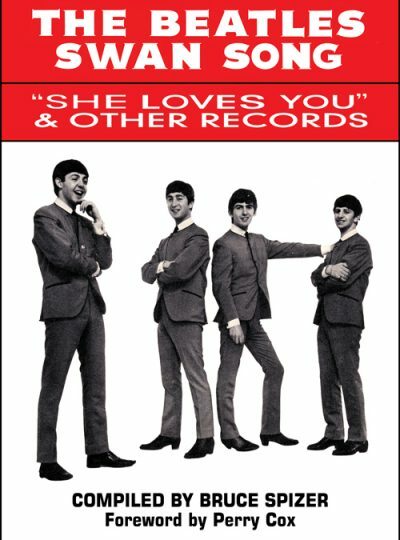 BEATLES BOOK OF THE YEAR? Wow. 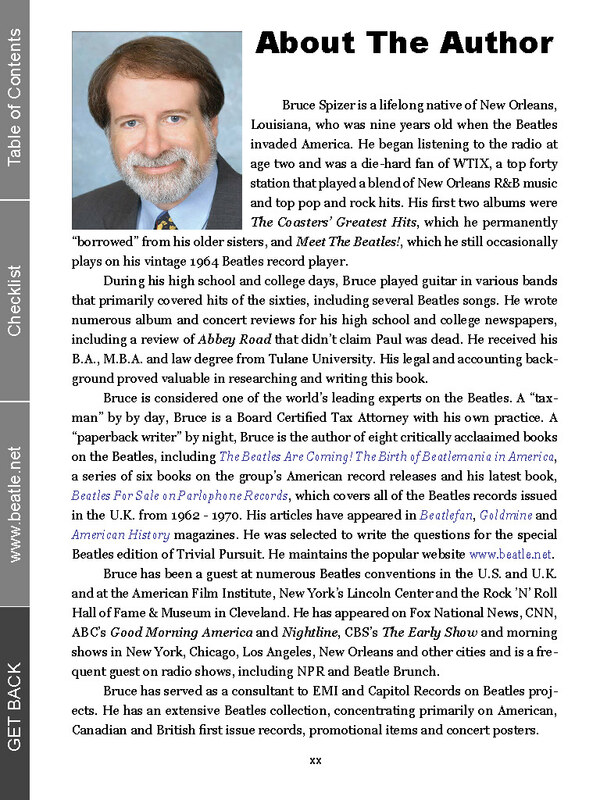 Bruce Spizer, a lawyer and CPA from New Orleans, has come up with an early candidate for Beatles book of the year. 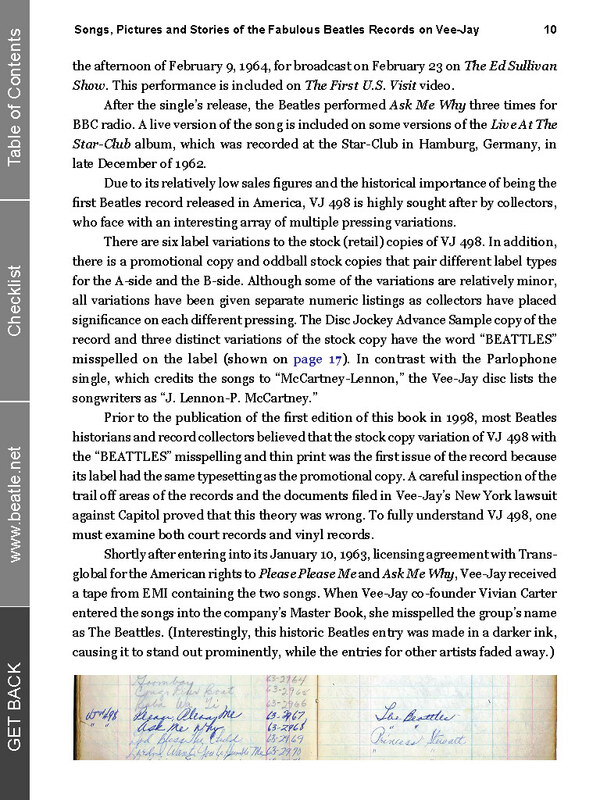 This meticulously researched and beautifully presented tome finally presents the truth behind one of the murkiest and least understood chapters in The Beatles’ story: their association with the small U.S. record label Vee-Jay. Filled to the brim with reproductions of record sleeves, record labels, Vee-Jay corporate documents, telegrams, advertisements, and legal documents (and more! 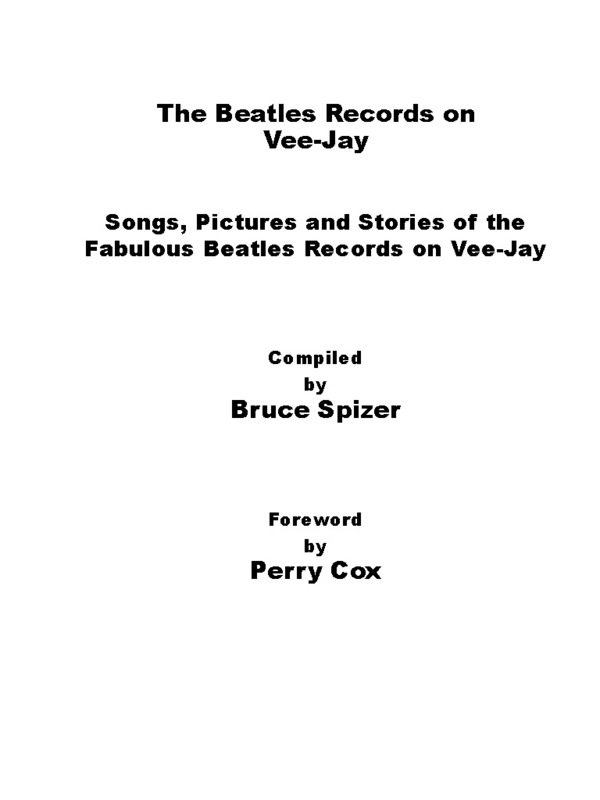 ), Spizer somehow finds space in this book to present a well-written (and oftimes humorous) text that chronicles the Vee-Jay story in amazing detail. Moreover, Spizer has gone out and done what so few seem to do these days: primary research. 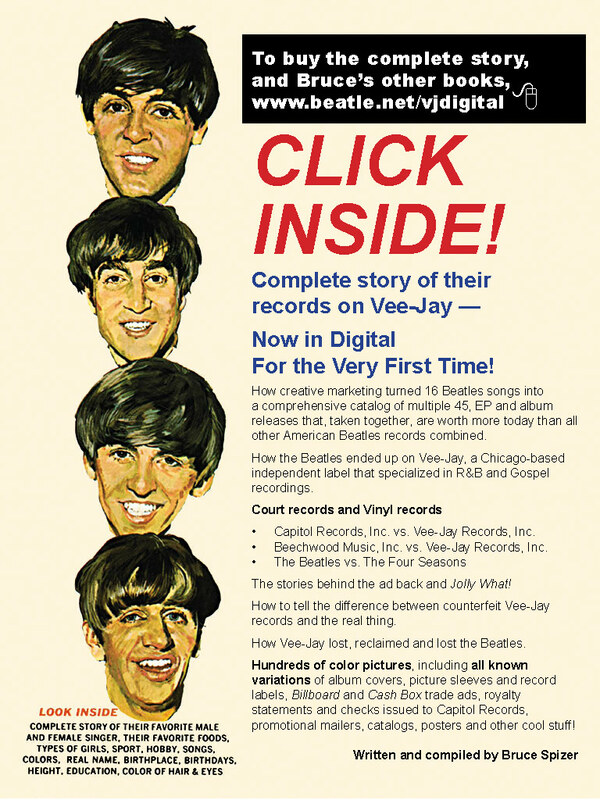 The sheer amount of new information contained here would be well-worth the price if that were all “The Beatles Records on Vee-Jay” had to offer. It isn’t. 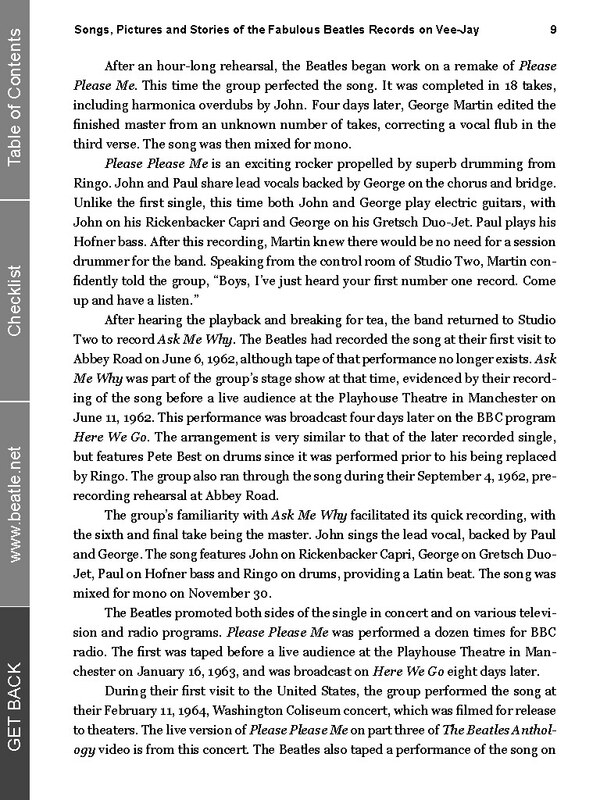 From the color photo reproductions to the fantastic layout from the choice of paper stock to the beautifully designed end papers, this is without a doubt the best presented Beatles book ever produced–and it’s a private publication! And within, revelations abound! 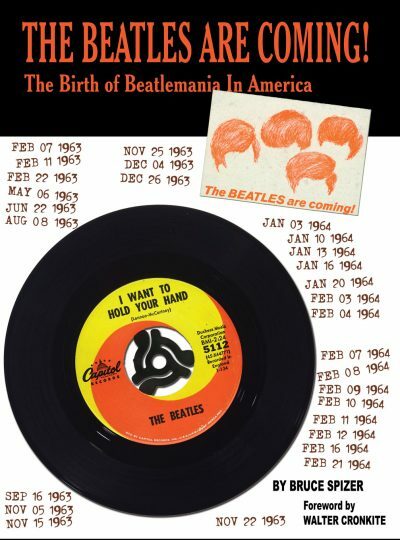 From the first ever accurate information regarding release dates of “Introducing The Beatles” to the complete story of the courtroom proceedings that eventually prevented Vee-Jay from issuing further Beatles product. 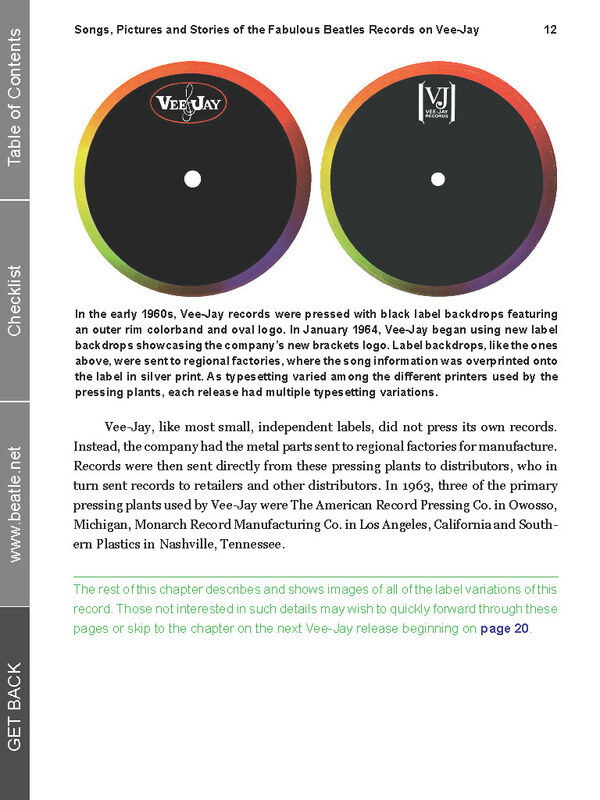 Minutiae regarding Vee-Jay’s pressings, their ad campaigns, marketing strategies. 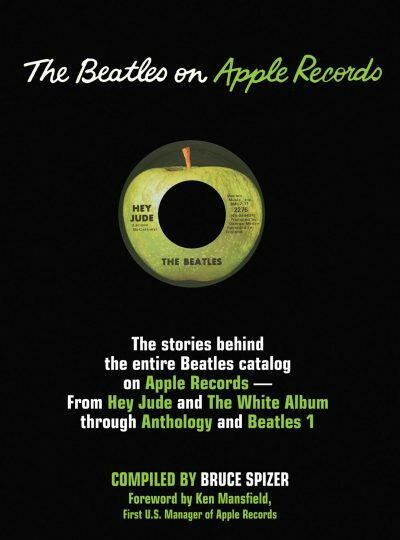 This is an absolute must for the serious Beatles scholar and a hell of a wanna-have even for the more casual collector. 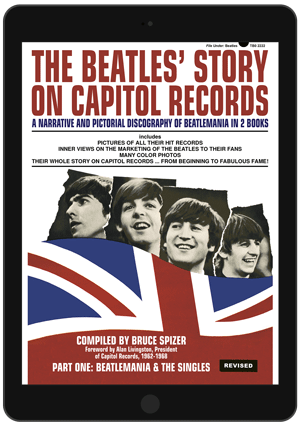 Spizer is now considering a sequel: a similar tome on The Beatles on Capitol Records. One can only hope he takes up the challenge! In the meantime, I can merely bestow the highest possible compliments and accolades to him on this terrific piece of work. It’s so damned good, I wish I had written it. 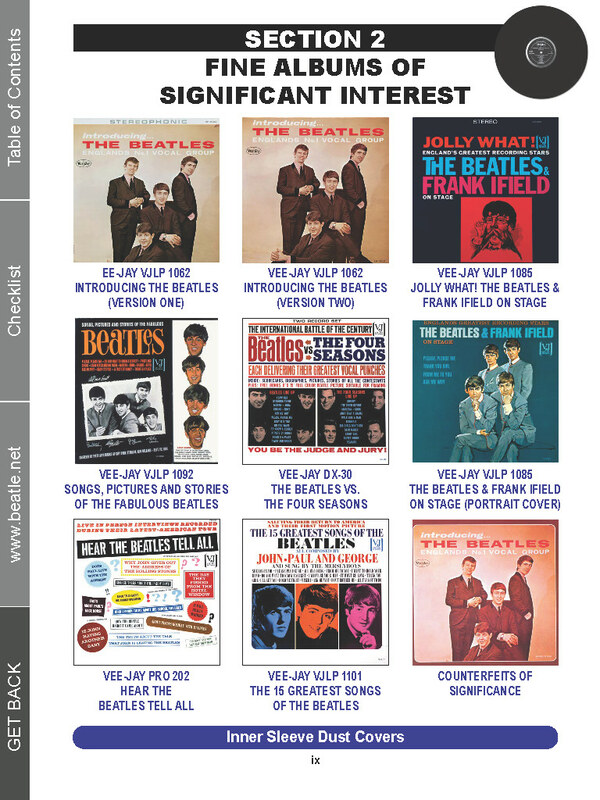 Here we have an entire book devoted to Beatles records released on the Vee-Jay label and its Tollie subsidiary. Sound like a short book? Wrong. Sound uninteresting? You obviously haven’t seen this book. 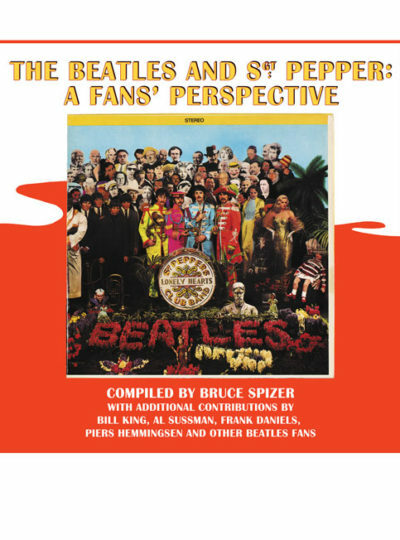 Author Bruce Spizer has taken a footnote in the Beatles story and spun it into a gorgeous 242-page hardcover volume. 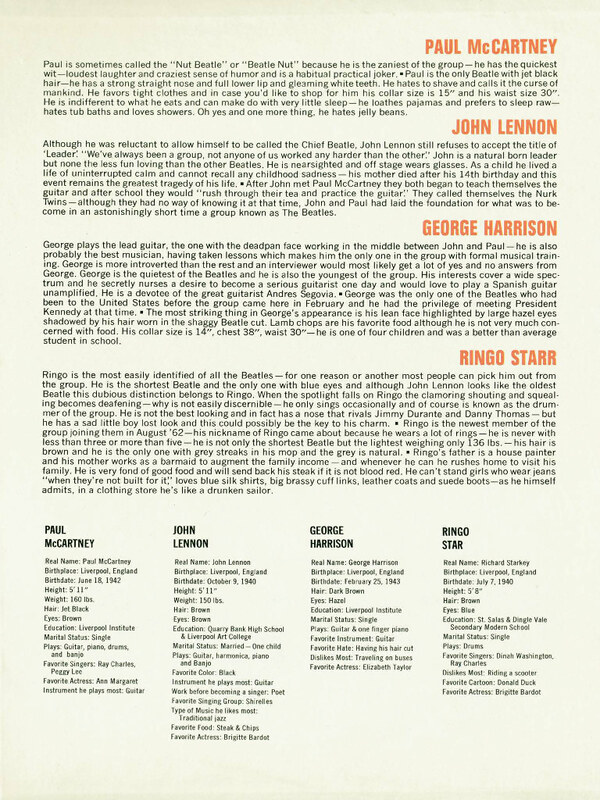 In his diligent pursuit of every detail about this subject, Spizer has assembled everything from record sleeves to royalty statements, making this one of the best-looking Beatles tomes ever published. 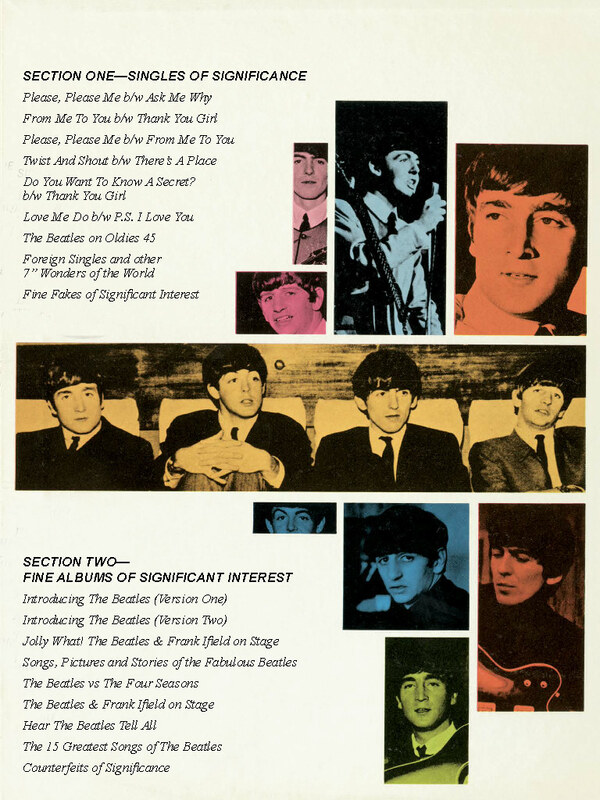 The glossy pages are packed with illustrations, which not only evoke Beatlemania, but also reveal a lot about the way records were made and sold in the early ’60s. 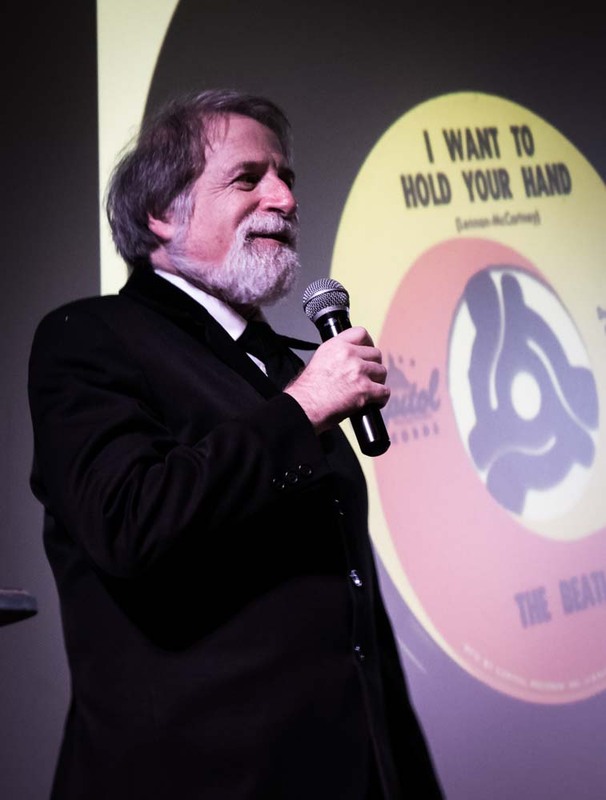 There are fascinating insights into how the Beatles were signed to Capitol, how Vee-Jay tried to cash in on Beatlemania and how Capitol tried to stop them. Spizer is a lawyer and gives special insight into the legal battles between the two labels. 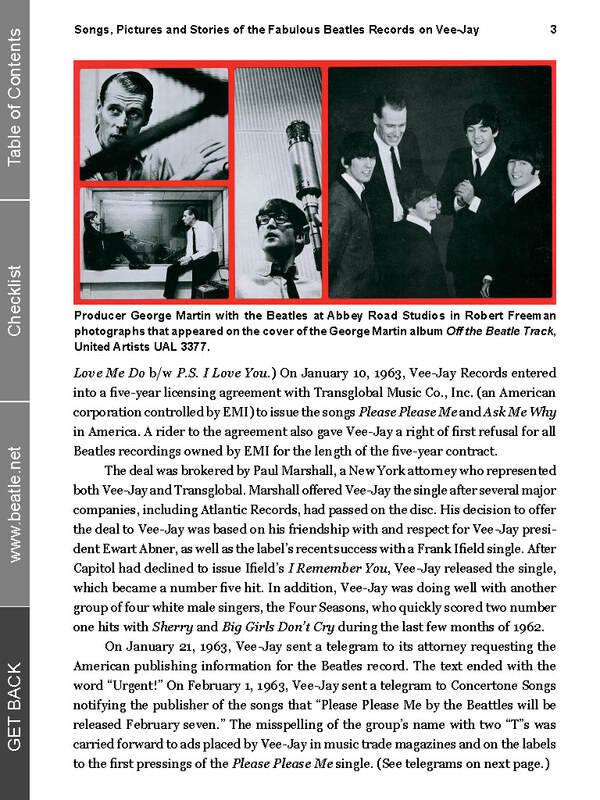 In fact he has researched this book as though he were preparing for a court case, leaving no stone unturned in his efforts to tell the story of the Beatles on Vee-Jay. 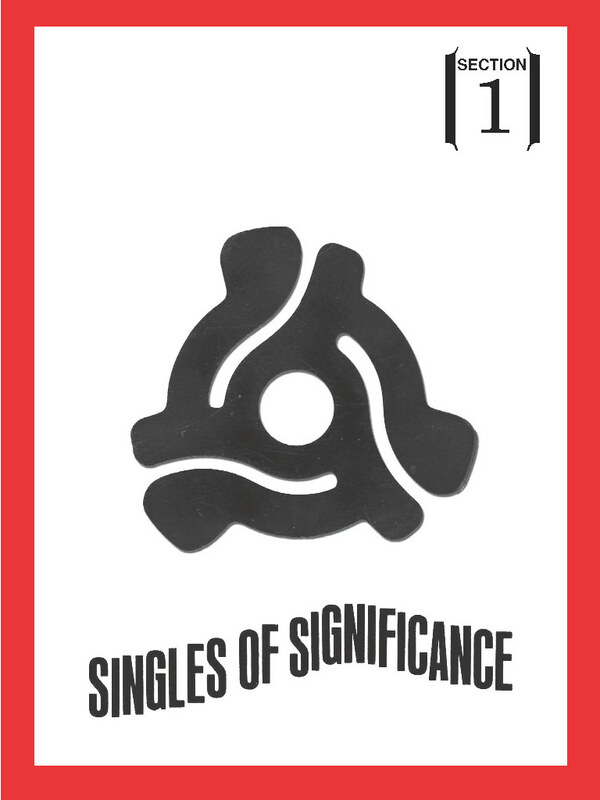 This is–to use the lingo favored by Vee-Jay’s press department–a fine book of significant interest. 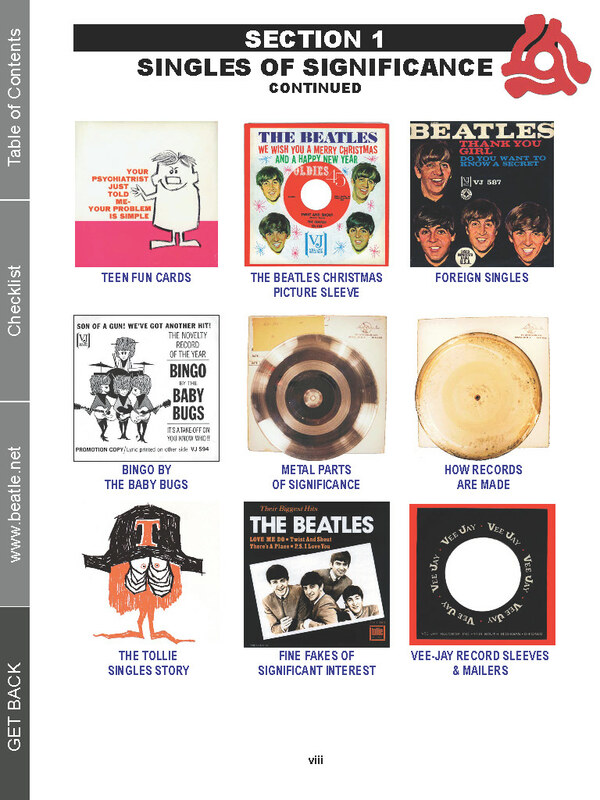 Songs, Pictures… is one of the most amazing Beatles collecting guides to have come out in recent years. It is similar in look (and weight!) to that of From Star Club to Cavern as far as quality of detail and of layout and production. A very superb book with professionally-produced photographs, all in full colour. 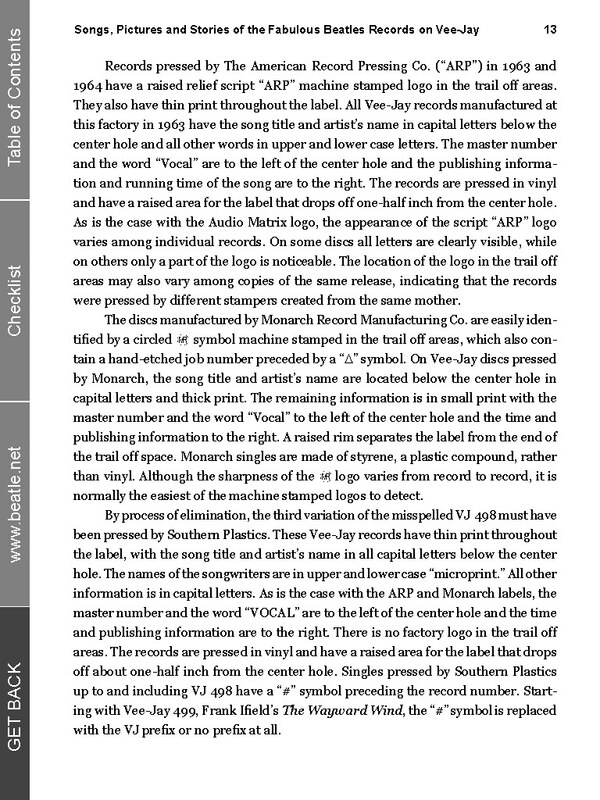 The investigative approach Bruce applied to his book is evident in the detailed information in his book, from label variations from the different pressing plants to original record distribution paperwork, royalties certificates and even magazine advertising invoices! 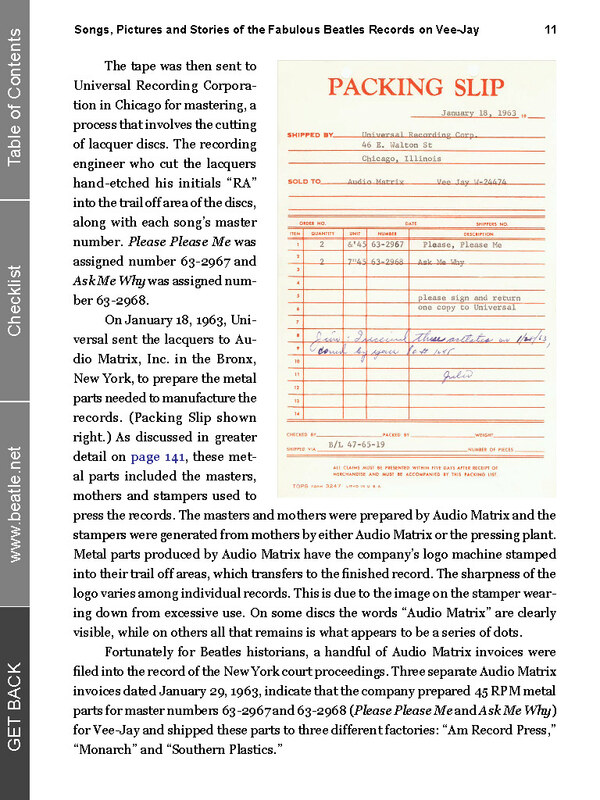 Of particular interest to collectors should be the new cataloguing method Bruce uses to list the various pressings. 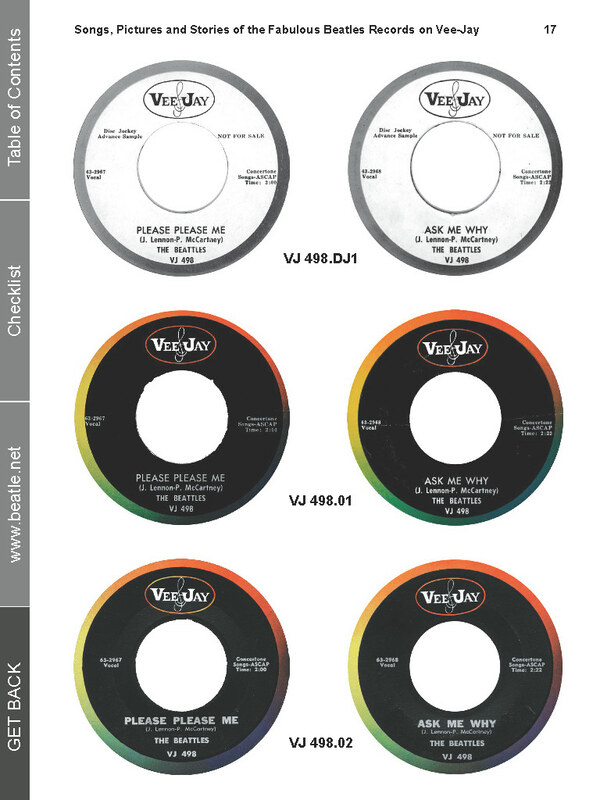 Since Vee-Jay had as many variations of each release as they did months in which they pressed Beatles’ records, this numbering system is ideal reference for collectors. It sets the standard by which all pricing guides in the future will no doubt follow. I highly recommend that anyone interested in buying any of the original Vee-Jay pressings should have this book close at hand so you know exactly what you’re getting into! Thanks for the reply Bruce. Maybe I'll be able to find a lesser condition copy of the Vee-Jay book (it wouldn't bother me) as I'm really only interested in completing the set. They are great reference books, a pleasure to read, and great chance to see pics of all those rare pressings most of us will never get a chance to own. 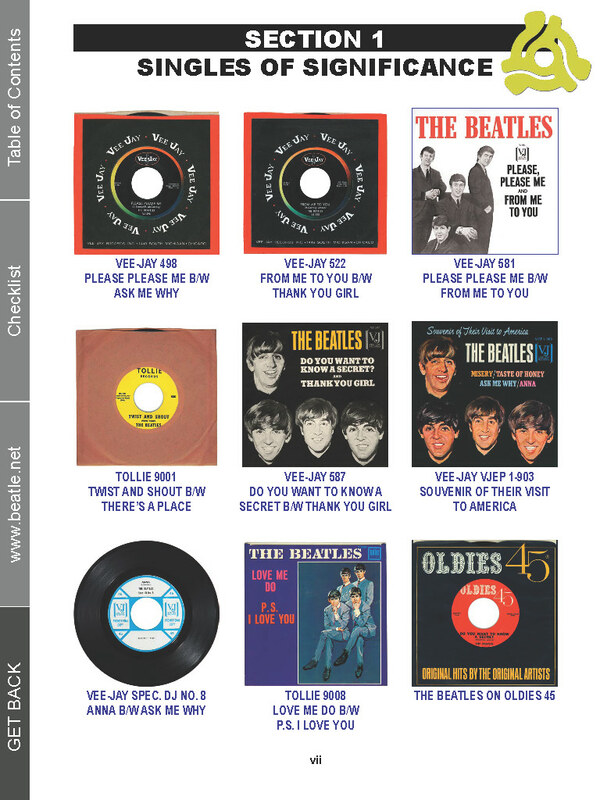 Please Bruce,reconsider re-printing the vj book.I need it to complete my collection. Whilst I'm lucky enough to own a copy of the VEE-JAY book for which I paid 300$ last year, I would love an up-dated book if you were to publish one. 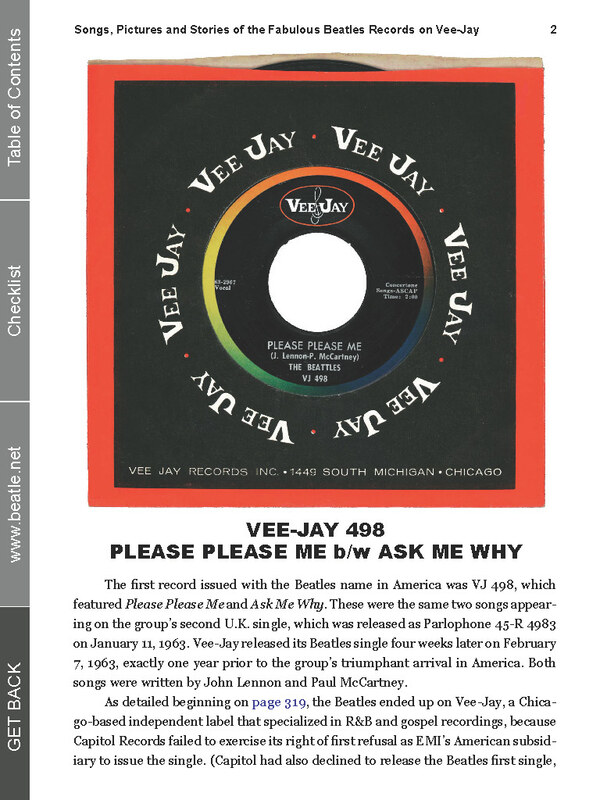 If it's anywhere near as good as Beatles American Records, I'd love a copy of the Vee-Jay Records book. From your comments, I assume you believe the plates for the original were lost in the hurricane. Has that actually been confirmed or does the printing company no longer exist? With the book printing business in the dumps now that Ipad, Kindle and Nook have taken much of that market away, there might not be any US printers remaining outside of regional firms. Thanks for your work. 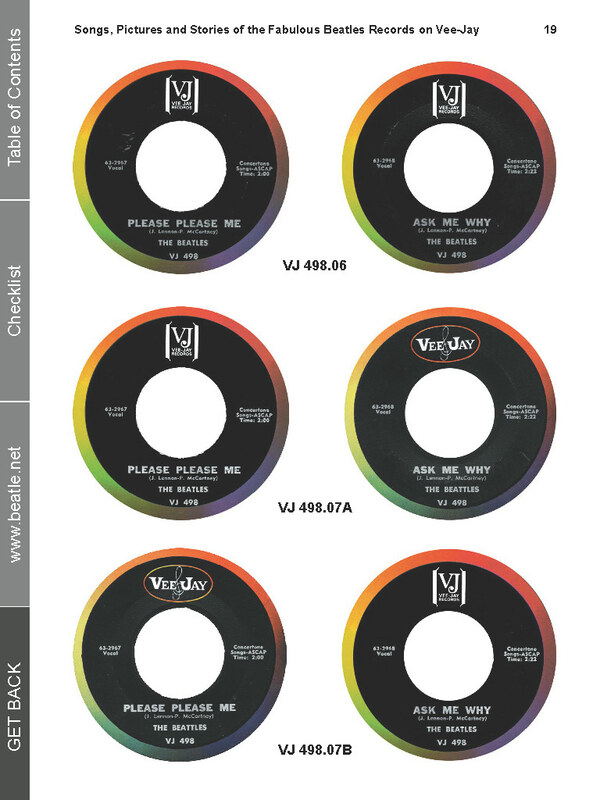 I would be prepared to put down a deposit as an assurance that I would order a copy of Beatles on Vee Jay.Like everyone else I would like to complete the collection!Please print it Bruce.Thanks,Richard. Put me down for a copy of the Vee-Jay releases. 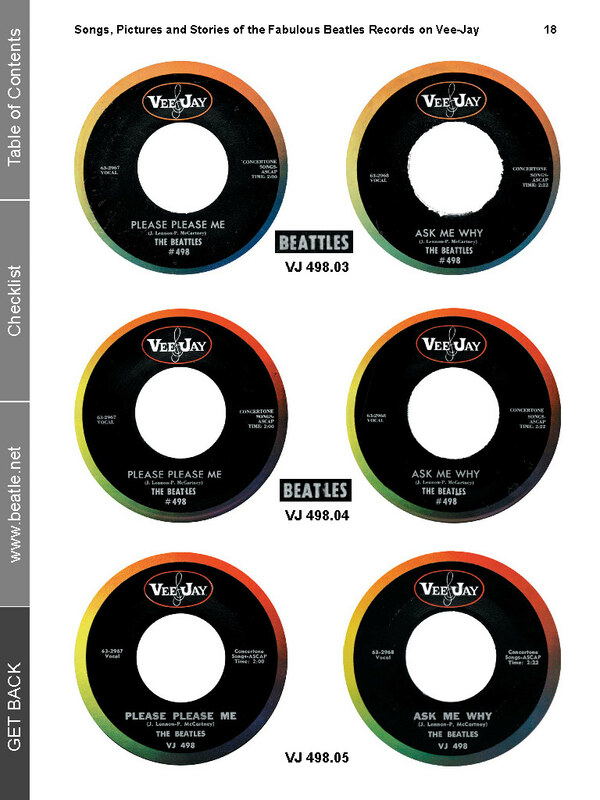 Just ordered the new "Beatles for Sale" mono cover in the limited edition version. Can't wait to get it! 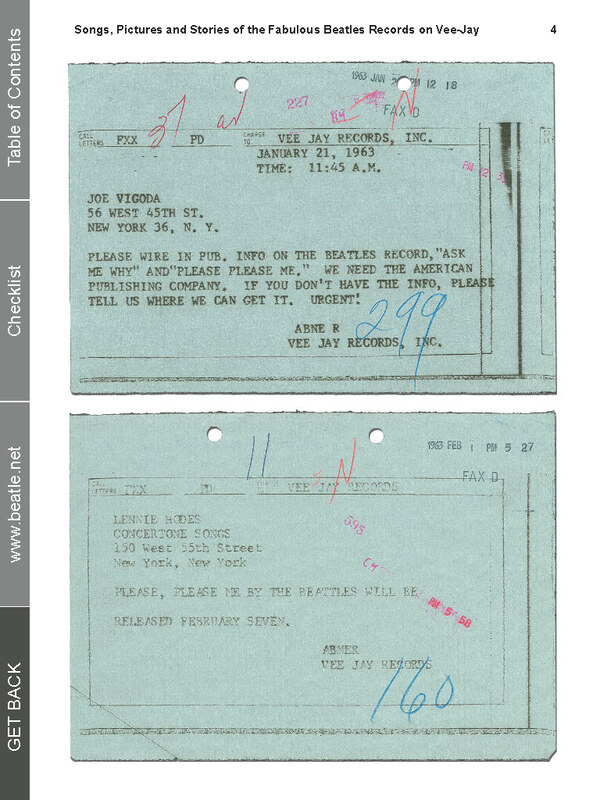 I Would like a copy of THE BEATLES ON VJ RECORDS. Like so many other people it's sad that so few were published???? THE COUPLE that I HAVE SEEN are priced for THE RICH AND FAMOUS. THAT'S a trvisty! Bruce, please count me in as a potential VeeJay book purchaser, guaranteed. Have all the others, just never realized this one would sell out as fast as it did. My Bad! Thanks Bruce for all that you have done to help advance the world of collecting the most amazing band on the planet....The Beatles! 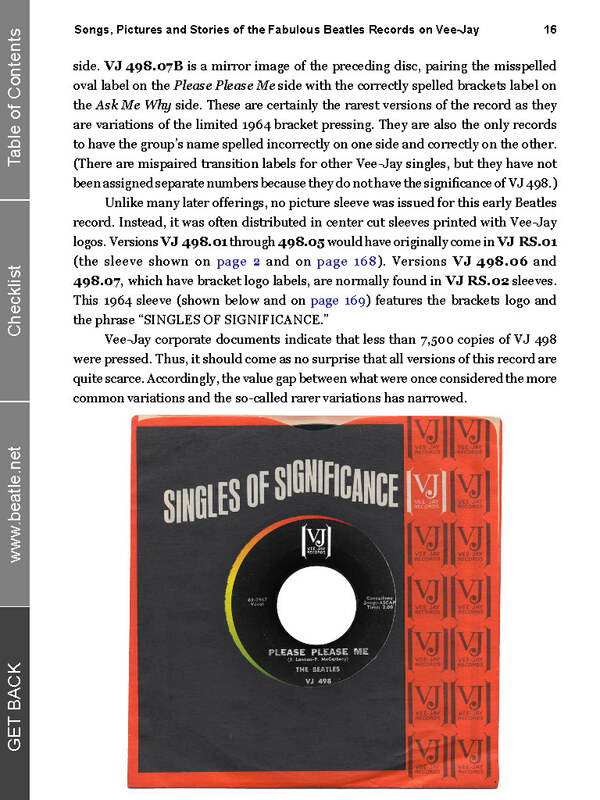 Great to see the Vee-Jay book made available digitally. It is also nice to see that there will be digital updates. And last, it means I no longer have to continue to wreck my original hard cover edition from scanning pictures, checklist, etc. Hopefully this is a process that is going to continue and the one that is really screaming for a digital edition is the price guide co-authored with Perry Cox. Hopefully it could also contain some kind of method of cataloging our collections along with updates as new findings occur and prices change. But first things first, looking forward to the digital Vee-Jay. 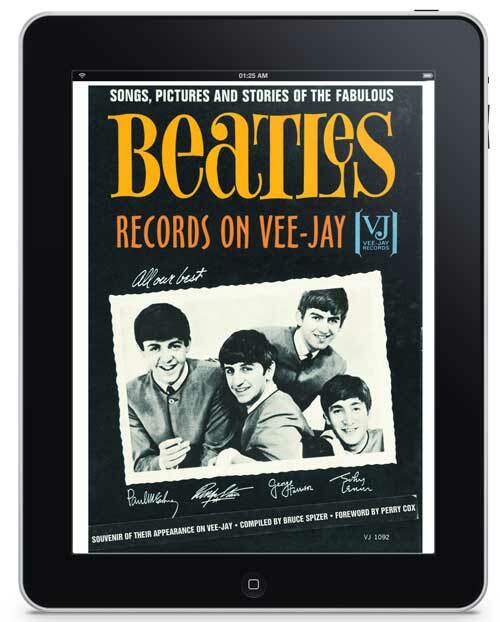 Finally, "The Beatles On Vee-Jay" makes a triumphant return! 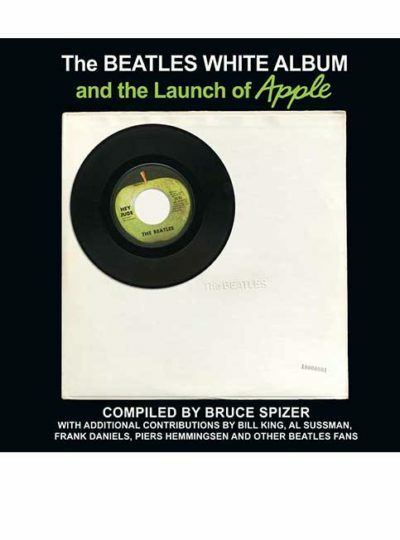 This was the very first Bruce Spizer book that I ever purchased. Now, it is a thrill to have it back, once again. Way to go! Thanks, Bruce. 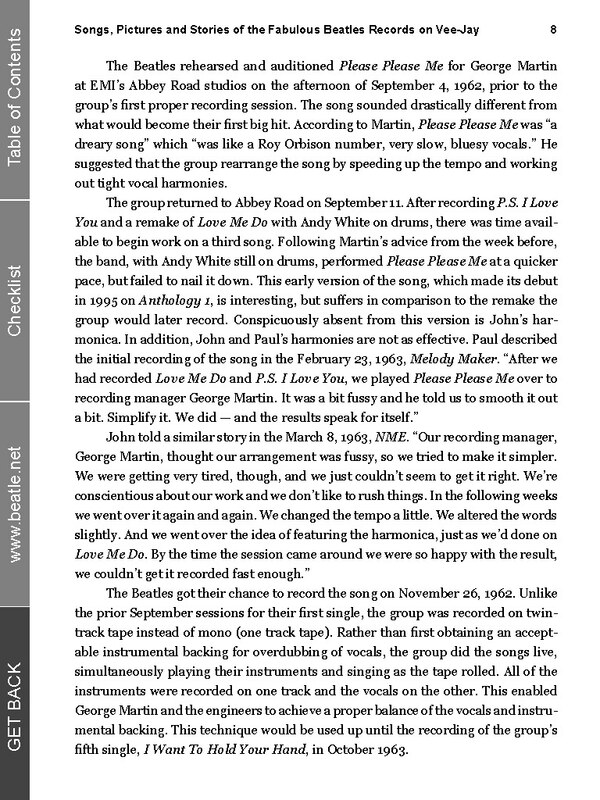 I just bought the eBook version of The Beatles on Vee-Jay. I hope you continue to release the rest of your books this way so those of us who missed out on the physical versions can still enjoy your work.